It`s been around four years since I had started blogging. I started blogging at the age of 27, while I was working as a Customer Support Executive. I have been asked many times about is Blogging a better career choice. In the beginning, I started blogging as a relationship advisor, which bring good fortune for me, But I was more interested in technology, So I moved from relationship blog to technology blog. So Today I am going to discuss with you is blogging as a full-time career or part-time work. Other people are reading : Shared Hosting Vs Dedicated Hosting : Which is Best for You? I am a professional blogger, but now I prefer to call myself a Digital marketer or Internet Entrepreneur. Today I will discuss various scenarios that will come in front of you if you plan to become a professional blogger and do blogging for a full time. I see many people who don't want to do any job, so they start blogging to make money. But they don`t even know that blogging is much more difficult if you are not consistent. If you can`t get successful on job chances are that you hardly get successful in blogging. Still, some bloggers are good at blogging even when they were not good at their jobs. Odds are everywhere. Blogging requires patience, skills, dedication, and creativity. There is no doubt that you can earn the hell lot of money from blogging but only if you have patience. Blogging is about learning, understanding, analyzing, writing and sharing. You need basic web-design, good English, good Internet skills, excellent reading writing skills and SEO skills. None of these can work without the others. You may make money for some time with some tips or tricks but to stand always you need these skills. You can`t just make money by clicking over some ads or do some simple surveys. Even if you find some such network, it will hardly pay you anything. So you must understand that making money online is not just an easy task. It never happens overnight. You need patience, skills, dedication, and knowledge. It also requires some skill set, experience, and commitment. Noone recommends you to quit the job and start blogging same time. You should begin blogging part-time while doing other tasks and once it get high value and you start getting good money, then you are free to quit the job and move to full time blogging. Even the most popular bloggers such as Tony John, Amit Agarwal, Gaurav Kumar have started blogging part-time. Blogging is for everyone, but still, it is not everyone’s cup of tea. More than 10k people search to make money online daily on the Internet, and hardly 5 of them get success. So the success ratio is not much high, but it is also because they lack planning, knowledge, and commitment. I have always said it many times that if you are blogging for the money, you will get fail, but if you are blogging with passion, you will still get success. Make Blogging your full-time career only when you get successful as a part-time blogger. I respect women, and I must say that in India it is easy for females to grab attention even as a blogger. But if you are a male blogger, then you should read this post thoroughly. Blogging alone or Blogging with a team? I always recommend that success comes when you have a team of great thinkers and dedicated professionals. You should have a team, but this also varies from person to person. I have a friend who earns $2000/month working from home, but there is a blogger like Amit Bhawani who have an office and a team of the content writer to work on blogs. That can bring more benefits to Indian society. 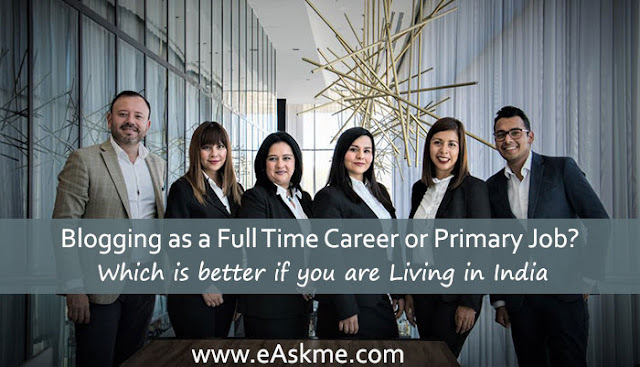 If you care what people think about you then you should never work from home because in Indian people don't care how much you earn, all they care if you work in a Company or not. A friend of mine didn`t find a good match to get married for a few years just because he was working from home. 99% people on matrimony sites prefer person working in MNC. When you start earning good money, I recommend you to start your office, as this will bring respect and also bring discipline to your work. If you are already wealthy, then you can utilize your money to gain respect in Indian society. The biggest reason why people do not choose blogging as a full-time career is that earning from blogging is not consistent. Earning depend upon many factors such as popularity, followers, Google Algorithmic updates, etc. I meet some people regularly who want to hire me to work on their blogs or websites. I always ask about their blogging experience, and usually, I get the answer that they used to make thousands of dollar or hundreds of dollars, but after Google updates, they are not able to bounce back. This happens because of the monotonous strategy. With time everything needs to evolve. Earlier it was the quantity of traffic which was giving value to sites, but now it is more about quality. Always start blogging as a part-time and when you get success then make it a full-time career. Try to begin office rather than just blogging from home.